I stated in a previous post that XPO would be supporting one-way multi associations. Unfortunately, this is now not the case. At the time I wrote the previous post, Developer Express had marked my request as accepted, but have now changed that to rejected. "To sum it up, we think that the current design of one-to-many associations in XPO is reliable and transparent. We are not going to change it, unless we have strong arguments for doing so." Well, although it's a shame that it's not going to be implemented, you can't argue than that! You can find the request thread here (but may need to register). If you still want to keep your XPO code clean, you can use some IL enhancement with PostSharp - details here. Update December 2008: this has changed and is no longer to be supported. See here for details. I'm happy to say that Developer Express have now accepted my request to support one-way multiple associations in XPO. See here for more details. The Express Persistent Objects (XPO) ORM from Developer Express does not support one way associations with multiplicity greater than one. Each collection association from a type must have a corresponding reverse association from the linked type. The reverse link can be either a unary or a collection (making either a one-many or many-many association, respectively). I put in a request for one-way multi associations here (you may need to register to view). The response I got back was basically that implementing one-way multi associations would "break existing functionality and this approach contradicts with the XPO concepts". I think that this is a shame, but there you go. So, given that I want this feature, I'm going to find the middle ground: let's have one-way associations, but use PostSharp to implement the extra code to keep XPO happy. So, for my one-way association there must be another property or field on the linked class as well as marking each participting property(or field with the Association attribute. Not a huge amount of extra code and not an unreasonable amount either! Add a public field to a class. Add an attribute to this new field. Add an attribute to an existing property. If you care about the reverse link, you will want to implement it yourself as is usual in XPO. The way we are doing it here means that the generated reverse link will not be visible at design time from inside of its own assembly (but it will be from outside the assembly). Also, the current implementation is not compatible with the Compact Framework or Silverlight. For this you will need to use the upcoming version 1.5 of PostSharp - more details here. As you will see from the PostSharp web site, PostSharp is made up of two main sections - PostSharp.Core and PostSharp.Laos. PostSharp.Laos is a plugin on top of PostSharp.Core that simplifies a lot of the common tasks in AOP. PostSharp.Core is the main engine that enchances your code at compile time. It is both powerful and deep, and I am certainly not an expert in its use! However, despite all the power and depth, it is also fairly accesssible. The PostSharp website uses the lovely term "Pay-As-You-Use Complexity" for PostSharp - you can acheive pretty much anything you want and the common tasks are made fairly simple (by PostSharp.Laos), while other tasks may require you to gain some more knowledge of the inner workings of PostSharp (meaning PostSharp.Core). In my previous articles about PostSharp, we used PostSharp.Laos, for this task we are going to use PostSharp.Core. In this article, I'm going to show how to add fields and attributes to classes using PostSharp.Core. I was inspired by Ruurd Boeke's articles, which you can find here. Ruurd uses PostSharp to enchance POCO classes for the Entity Framework use and goes a lot further with PostSharp than I do here. I highly recommend reading Ruurd's articles for more detailed information. In line 4 we use a bit of LINQ to iterate through the properties of our target type that we are interested in enchancing and then in line 6 we call a helper method to get the name of the field we want to generate. In lines 7 and 9 we add the aspects. In line 7 we add an aspect to the type at the other end of our collection and pass it the name of the type of the field we want to add, along with a field name and a string to be passed to the association attribute that we will add later. Note that we are using an extension method helper (GetCollectionTargetType) to get the type at the other end, although this is nothing more than normal reflection code. Next, in line 9, we add another aspect to the type that is declaring the collection property, passing it the name of the property that will be enchaned and a string that we will pass to the attribute that we add to the property. So, we have used PostSharp.Laos to add aspects to our classes. These aspects contain some information that we will use later. In fact, as you can see below, the aspects that we have added contain little else other than the information we want to use later. Note that these tasks implement ILaosTypeLevelAspect as we are applying the aspects to types. Okay, so we've now got a task setup to let PostSharp's weaver loose on our aspects. We now just need to define what the weaver needs to do. Ttrue to its name, the factory is responsible for providing instances of types that can do some work for us. Note that the factory is looking for the aspects that we added in stage 1. When a OtherEndFieldSubAspect is encountered, an instance of AddFieldWeaver is created and returned to PostSharp. When a AssociationAttributeSubAspect is encountered, an instance of PropertyAttributeWeaver is created and returned to PostSharp. The waever is an implementation of the PostSharp TypeLevelAspectWeaver and its Implement method is where the new field is created. This method simply creates a new FieldDefDeclaration that represents the new field, sets its name, defines its visibility (by setting the Attributes property) and sets it's type. The type is derived from a helper property called FieldType which uses PostSharp's built in Task.Project.Module to find the type of the name that was specified when we created the attribute in stage 1. Then, the new field is simply added to the target type's fields collection. Next, a helper method is called to create an instance of the custom attribute we want to add and is added to teh new field's custom attributes collection. That's all there is to it!!! PostSharp has been widely praised for having a very clean and well designed API. After doing this I can really see why it is so well thought of - we have been sheltered from all the horrid IL generation that is usually associated with this sort of task. Quite simply, PostSharp totally rocks and Gael Fraiteur has done an amazing job! So, most of the above has been about PostSharp. Specific to XPO, the custom attribute I have added is the AssociationAttribute required by XPO to link the two sides of the association. So, I started with a one-way association and have used PostSharp to magically turn that into a two-way one-many association. If you want the code, you can get it from here. Note that I've put up the XPO version and a version that doesn't require XPO. Update: I've edited this to show that the XPCollection were the generic XPCollection 12-Nov-2008. Changing a property value will raise the changed notification events. Accessing a collection will instantiate and set up the collection. XPO objects notify observers of changesto values using a changed event. Collections have similar events events are fired when the collection changes or when an item in the collection changes. Note also that the GetCollection method above sets up the collection so that it is aware of being a property of a containing object. This will also be handled by the attribute. Okay, if you've got this far, you must be wondering how do we actually do this? The answer is that we use the incredible PostSharp to help us add the required code we need into our objects. PostSharp is an aspect oriented programming (AOP) library and toolset that makes it easy to add code into your objects during compilation. As the changes occur at compile time, you avoid the runtime performance hits that would come from using reflection. PostSharp makes the process of generating and adding IL code to your assemblies at compile time ridiculously easy to acheive for such a complex task. Although PostSharp allows you to drop down and weave any IL code you like into your assemblies, there is a The PostSharp website has a number of excellent examples of how to work with PostSharp, which are extremely impressive and worth checking out. It is also very well documented. PostSharp is an open source library that is free even for commercial use and, incredibly, is the work of one man: Gael Fraiteur. Everything that we do here is based on the excellent examples that Gael provides with PostSharp, so check those out when you can. Remember that all this code is firing at compile time so the reflection will not affect your runtime performance! So, in line 1 we check that the property (a PropertyInfo) is read-write and is not a collection. We then use reflection to access the property's setter in line 3 and check that we are not looking at a static property in line 4. In line 6 we create a new PostSharp aspect - the PropertyChangedNotifierSubAspect - and add it to the collection that PostSharp supplies. Note that the name of the property is passed in to the aspect's constructor - this is how we avoid the use of string literals for property names. After this, PostSharp does all the work for you. Well, PostSharp does the IL weaving for you, there's still a little more for us to do. We simply override the base class method and use the data supplied argument's to access the object whose property has changed. We cast it to be an XPBaseObject and use the GetMemberValue to access and store the value of the property on entry. Note here that the GetMemberValue is supplied by Developer Express and is performance efficient (itself using generated IL to access the property value). If you are using XPO with your own objects that do not subclass the built in XPO types then you will have to use reflection or some other means to access the entry value. Note also that this code is executes at runtime. Again, PostSharp supplies us with event args that allow easy access to values. We also use our IPropertyChangedNotifier interface to do the notification. In line 4 we access the new property value from the event arguments supplied by PostSharp (again, no reflection needed!) then call a method to check for changes in line 5. If we have a change to the property, we instruct the object to notify the world of the change in lines 6 and 7. Okay, so where are we now? We've used PostSharp to create a special attribute. We've applied the attribute to the classes in which we want to use automatic properties. 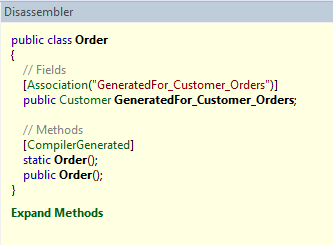 PostSharp recognises our attribute and injects code into our assemblies at compile time. The code that is injected is defined by us in classes that we create from buit in PostSharp types. These types are called aspects and we used the one that allows us to modify a method - specifically, the property's setter method. To modify the method was pretty easy - we just override a couple of methods and use the information that PostSharp passes back to us to do what we want. PostShapr also allows you to work with fields and add code to when the fields are accessed. The way I initialise collections use this feature of PostSharp, but I'd suggest you head for the PostSharp site to learn more of what you can do with PostSharp. Before we leave this, there's one gotcha to be aware of: the release version of PostSharp, 1.0, does not play well in partial trust scenarios. If this is important to you then you'll be pleased to know that the next release 1.5 addresses this and version 1.5 is in CTP2 stage at time of writing. If you want more, then you can get the code from here. In my previous post I touched on the fact that objects in Express Persistent Objects (XPO) support change tracking. One area that this is used by their Unit of Work to track the changes made to objects. 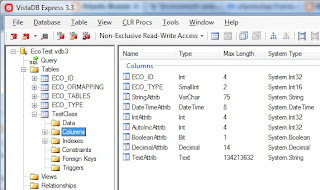 Another use is when data binding objects to a UI. So, how do you enable change tracking in your object model using XPO? 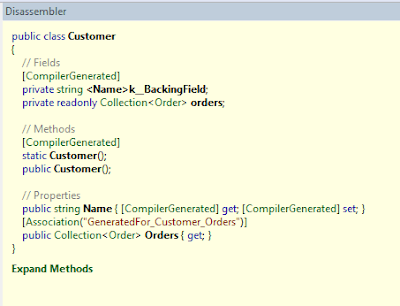 The classes above will give the same functionality - change tracking and collection creation - as the previous examples. Except, there is much less code to read, just automatic properties and an extra attribute on the class declaration. Take a look at part 2 to see how this can be done.